Friends and Heroes brings the Bible to life with it’s award winning animation series. They are a longtime friend to our website. They sponsor our website to let more people know about excellent Bible curriculum built around the DVDs. Friends and Heroes Series 1 Church and School Curriculum Pack – you can download a free two week sample to get a firsthand look. The giveaway on this post has ended and we’ve notified the winner by email. If you’ve never heard of Friends and Heroes, be sure to check out these video clips below. I would love to teach my kids with this great kit!! They love to learn by seeing, hearing and doing. Looks like it will be an amazing kit!! I would see how this resource works with my Wednesday class. 5th & 6th, but the majority are kids from our bus ministry who are for the most part, unchurched. They have little to know church or bible background, and many show little desire to learn. It’s quite difficult to find material that will engage them, without losing the “church” kids I have as well. I’ve been looking for something new to teach our mid week children’s service. This would be great! I would definitely use it in my Sunday School class! I teach a K-1 class every Sunday and it looks way more interesting than what I’m currently using. This series is awesome! My kids would flip over it. I have a music CD by them. This kit would drive it home! Love it! I have a diversely aged group of children ranging from 3-10 years old. This kits looks easy to use and apply for all ages. Love teaching who the true hero is in life. If I were to win this package I would use it to teach my children church how God uses ordinary people for His extraordinary work. I teach babies through kindergarten and they would love to see the bible come to life! It looks promising not only for children’s church, but possibly for VBS also. Thank you for this offer. This resource looks amazing! Most of all, we want to teach our children Biblically-sound life principles to grow their faith, and to equip them to be ambassadors and witnesses wherever God leads them. The animation is quite impressive and realistic. Not a silly type of animation at all. We know that whoever wins this resource will be quite blessed. have a Wednesday program right after school that I can see this being amazing addition. We are just starting homeschooling & this would really help my twins. We have been looking for tooks like this to use. I also run the Childrens Church class at our Church on Wednesday nights & I could use this there too. Thank u for the chance to win. I believe this curriculum would be beneficial to my youth bible study at my church. Thank you for the opportunity to be selected. I would use this in our homeschool co-op. I would teach it in my 2, Low Income Communities, where knowing Jesus and being Loved is important to many children. Many of these children belong to a single parent and do not know a Father figure, that’s where God the Father comes into our picture, they have a Father to look up to and learn from. This curriculum looks amazing! We would use this for our elementary jr church program. I am a primary school Bible Education teacher in a small private Christian school. I would absolutely love this curriculum set to improve my lessons and get the kids more engaged to get them to know Christ and encourage them to live by the values taught. This curriculum looks perfectly suitable to my preteen Sunday School to encourage them to be brave and courageous. If my family won the friends and heroes curriculum pack I would use it to teach my children more about the Bible and any and all other children that I could reach with it. I believe every child should be learning more about the Bible and less about worldly things. Every Sabbath morning we do prayer and Bible study throughout the first half of the day. I have been looking for something like this to help make learning more interesting for them. I would be thrilled to win this. This would be a great resource for our small Sunday School group because it could be adapted for our wide range of ages from Pre-Kinder-6th grade. The DVD base would hold the interest of the entire group, while the activities could be tailored a little to work with each age level, even within the same room in little groups for application. Thanks for what looks to be a great curriculum resource! We don’t do a traditional VBS and I think we could work this into a really cool summer opportunity for our elementary kids. Would love to win for my jr. Church group! I would love to use this curriculum in our Children’s church program. I would love to win this for my Sunday school kids! They would have a blast learning with this material. Would love to win this for our small church! The kids would love it! As a Sunday School teacher for about 9 years and having grown up in Sunday school and not having resources such as these, this resource would be great for our kids not only in the church but at the two community Sunday schools that our church runs as well. If I were selected to receive the Friends and Heroes Series 1 Church and School Curriculum Pack it would certainly be a blessing from God. I have been serving 8 years as pastor of a small congregation and I recently felt compelled to take over the teaching ministry for our children’s ministry. We only have one children’s class with two students, ages 5 and 8, boy and girl respectfully. My wife was the children’s ministry leader for the first five years of our ministry at this church, but my wife had some serious back problems and after two major surgeries, she is hoping to return to teaching in about 6 months. We had a lady who began teaching the class about 10 months ago and she started out pretty well but she eventually was not very dependable about being on time. Our class started at 9:30 am and she would usually arrive around 10 or 10:15 and many times just not come at all(her grandson is the 5 years old student). So just in the last few week I spoke with her and she was very relieved to relinquish to class to me to teach. The only curriculum we have been using the last year was mainly the free resources we were able to get from the website for Ministry-To-Children. We recently used the lesson 1 on Ark Man and just this past Sunday used lesson 1 for God Gives His Commandments. They have been very helpful and a Godsend. I have been researching curriculum at several websites and I feel yours will best suit our needs. We are planning to go out into our community and encourage parents and kids to come but I want to have an established curriculum in place so I can be prepared when they begin showing up for class. Thank you and your staff for the ministry God has placed you in. I would love to receive this curriculum for our small Sunday school group! It seems like it would keep all ages interested, which is one of our main struggles, to keep all ages engaged. We have about 14 kids ranging in age from preschool to 6th grade in one class. Hi Stephanie – we just ran the random drawing and your comment was selected. I’ll be in contact through email. Thanks again to everyone who participated! Awesome, I am excited to try this out!! I just replied to your email. Each Sunday I pull all children ages 4-10 out of “big church” and I teach them in the Children’s Worsip Center. Videos would be an amazing addition to the things I plan as the weeks progress! Thank you SO MUCH for this opportunity! Our church have struggled in reaching children and teens. My desire is to capture the imagination and desire of the few we do have by grabbing their attention with something that would be interesting to them. We started an outreach called ROCK (reaching our community kids). We have went from 2 or 3 to 12 to 15. It seems to be working. If I was to win the package I would use it to help with the ideas for these services. We do this once a month, however, the children seem to want it more often. Thank you so much for the opportunity to win this great giveaway !!! I would love to use the Friends and Heroes curriculum with my daughters to teach my 8 grandchildren. The videos and teacher’s resources, of lessons, activities and games, would be such a blessing to each of us !!! I am trying to teach my 4 year old granddaughter about the Lord. She is being raised and surrounded by people who don’t believe and are living as though there is no God. I keep her 2 days a week and I feel it is my ministry to introduce her to the Lord. Unfortunately I’m having a hard time interesting her in learning about Him and this look like something that might greatly help. 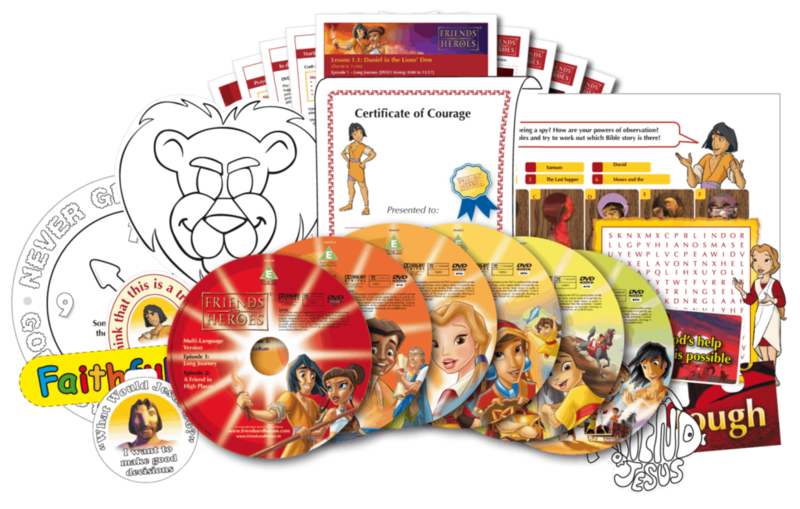 If I won the Friends and Hero’s series 1 curriculum pack, I would use it to help my children visualize what we read in the Bible and share the curriculum with their cousins, the church, & neighbors. This is a great tool for teaching. The opportunity is so appreciated! I plan to use it for our church Sunday School. We have children that are not from Christian families and need to hear the love of God. We do not have a budget for curriculum. I also work in a daycare and I share Bible lessons with the children. We’ve just started a Sunday school at our church. And starting from scratch! Currently no space in our old, historical building and no supplies. But we’re starting outside and excited to have the plans for a small building on our site we can use with the kids. Would love to share this with the kids when we get our new space! Tony Kummer (Editor) reviewed & updated this page on : October 26, 2018 at 2:07 pm. All our content is peer reviewed by our readers, simply leave a comment on any post suggest an update.